Update: April 2015: Xena wants to pass on her greetings to all of her supporters and friends, and her thanks for all your help. She will remain in the forever foster program at JNMRF to assure that her medical needs will be covered in the future. For the time being, she is an active, happy girl with a loving family and canine as well as feline friends. One cat, Muffin, is her special friend. Xena easily walks 5 miles on the weekends and is very lively. 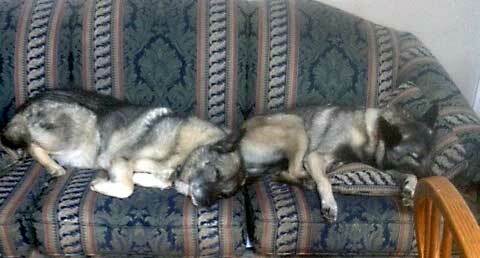 After these hikes, she often naps with her buddy Bear who was also a JNMRF rescue (on the left). Her future is rosy for sure! Update: Xena went for her hip evaluation on Oct. 26th, 2013, and things are looking quite good. We are increasing her activity level gradually, and we'll see how it goes. Xena will be evaluated again in a few months (sooner if any issues occur.) Her left hip is still dysplastic but not causing pain and her muscle tone is good. She may not need the second hip replacement! Her front legs are deformed from premature closure of the growth plates so she has limited range of motion - but, as the vet said, SHE doesn't know that and gets around quite nicely. She is not in pain from any of her joints now. She has quite a sense of humor, often grabbing the leashes of her canine brother and sister when they go for a walk - with the idea of HER walking THEM! She has learned to live with cats and is currently developing her skills at charming everyone she meets. 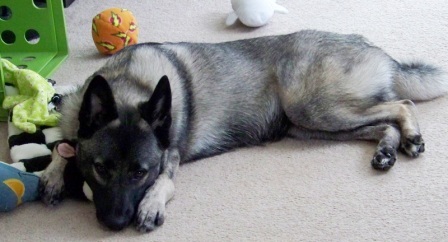 Update: Xena moved to a new foster home late in August 2013 where she will complete her recovery from her surgery. She is very happy now that she has much less pain and her attitude shows that. She wants to do everything her new foster brother does and he has been very good about understanding that playing must be kept low key until her full 3 months of recovery have passed. She will receiving follow up care in PA. Xena thanks you for your continued support. Her improving life would not have been possible without your support. She can't wait to see what her next adventure will be. Update: Xena's surgery was a success, although a specialized prosthesis had to be used because she of her hip configuration. 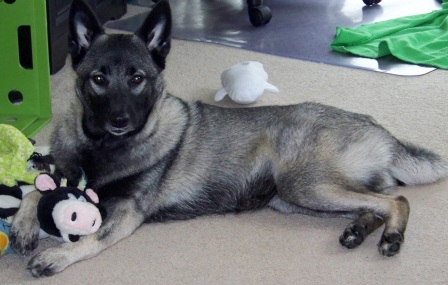 A very experienced surgeon was able to find just the right solution and Xena got her new hip. She was in the hospital a few extra days since she had some GI disturbance post anesthesia. What wonderful care she got at MSU Veterinary Teaching Hosptial. Special thanks to Sarah Ercolani for being there for her and fostering. Xena got back to her foster home today, 7/21/13. She has a long recovery of at least 3 months of limited activity. After 3 months, she will be re-evaluated for her other hip and for her gait. Thank you all for your continued support. Update: Xena's surgery for total hip replacement on her left side is scheduled for July 18. Please send her good thoughts for a successful surgery and calm recovery. She will be in the hospital for about 5-7 days. Thank you all for caring about her. Update: June 15, 2013: Thanks to your help, we are able to get Xena her first surgery, a total hip replacement which will be scheduled for this summer. We don't have the date yet but we will update this page as her care progresses. We still don't know what other specialized care she will need after the surgery. Any donations we receive in her name beyond the cost of this first surgery will go to her post-operative care, future surgeries, and to other dogs in the Special Vet Care program who are in need of extraordinary veterinary care. Thank you for helping this first phase of her future. Hi there, my name is Xena sometimes called Teeny Zeenie or even just ZZ. I was born in April of 2012 and my new friends at JNMRF tell me I'm a special dog. I LOVE to play with toys, pal around with my friends at my foster home, and most of all I love to wag my tail and be happy. I was actually saved from a high kill shelter in Ohio by a nice man who couldn't keep me after he had to give up his home when his life changed. He loved me and made sure I got to people who would give me a chance at a good life. My new friends at JNMRF say I'm a special needs girl and will have a life of restricted activity, pain and require special care if I don't have very expensive surgeries. I was born with something called hip dysplasia and will need at least one total hip replacement according to specialists at Michigan State University Veterinary Teaching Hospital. Also, when I was a very small puppy, my front legs were broken and not treated. Because of these problems, I have an abnormal gate and if I do too much exercise, I have a lot of pain. If you click here , you can see a short video of my cute little way of running taken when I first got to my foster home in rescue. I love my foster home and have the best of care plus loads of toys, hugs, and love. They give me everything they can and I love them. My foster mom even carries me to my favorite spot to look out the window. But I need lots of medical assistance which we are hoping all of you can help JNMRF to obtain. My doctors say that I need a total hip replacement this summer. They want to wait until July or August because my growth plates aren't closed yet. I don't know what that means other than we have time to collect the funds needed for this first surgery. It could cost $5000 or more. or you can click on the Donate button at the top of this page to send via Paypal directly to the Xena fund. If you can't afford to send money, please send me lots of Moose Magic for me to get better or sustain my ability to walk and keep my pain levels low. Thank you for supporting me and JNMRF in all they do for Norwegian Elkhounds like me. Help other special needs dogs like you did for Xena!